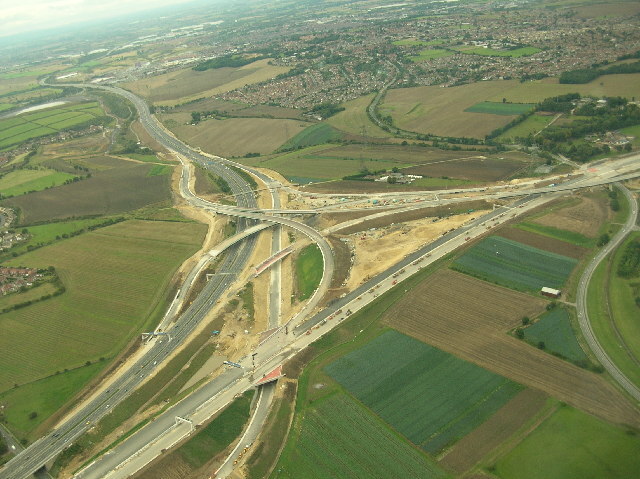 Aerial shot from above the junction being built to join the new, wider, A1(M) motorway with the M62. The new interchange will be more of a Spaghetti Junction of the North instead of a roundabout with queues on every slip road at peak times. The new junction will also be about 3km north-west of the old one, taking the new A1(M) to the west side of the Ferrybridge powerstation (out of shot on the right), instead of the east, as the A1 has passed for much of the last century. © Copyright Paul Johnston-Knight and licensed for reuse under this Creative Commons Licence. This page has been viewed about 3070 times.